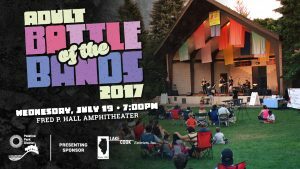 Palatine Park District will present the 2017 Adult Battle of the Bands competition on Wednesday, July 19 at Fred P. Hall Amphitheater, 256 E. Palatine Road, in Palatine. The performance will begin at 7:00pm featuring four local bands from the Chicagoland northwest suburbs, including Killing Bottles, Rocket Surgery, Pleasantries, and There Goes the Neighborhood. Killing Bottles is an Americana/folk rock band out of Mount Prospect. Rock Surgery takes songs from many genres and reconstructs them into dance-able, solid rock gems. Pleasantries is a progressive rock group with original music and recently released their debut full length album. Finally, There Goes the Neighborhood is a high energy pop-punk/alternative cover band that aims to have their audience dancing and singing all night. Each band will be given a fifteen minutes to perform with short breaks between each set for band switch over. At the conclusion of the event, judges will determine the overall winner of this year’s Adult Battle of the Bands. The winning band will be given the opportunity to perform at the Village of Palatine’s Street Fest event in August. Celebrating their 30th business anniversary this year, the 2017 the Adult Battle of the Bands is sponsored by Lake Cook Exteriors Inc. For more information about this event, contact Cultural Arts Coordinator Ashley Schiavone at 847.496.6237 or aschiavone@palatineparks.org.